A. Helping through the medium of the Shradh rites, the pitars who have attained the Pitrulok (Region of the pitars), gain momentum for their onward journey. B. Satisfying wishes and desires of the dead from our family lineage who, due to their unfulfilled desires have not gained momentum, meaning, who, instead of moving on to the superior regions are entrapped in the inferior region. Thus, providing momentum to their onward journey. C. Due to their evil deeds, some pitars do not go to Pitrulok. Due to their karmas they enter the ghost species. 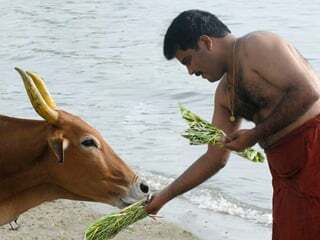 To relieve them from that species, the Shradh rites are performed. 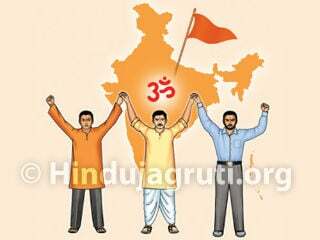 A. Repaying the debt unto the pitars is as important as repaying the debt unto God, Sages and the society. It is the duty of the descendants to respect their ancestors, donate in their name and undertake activities that will please them. As per the scriptures, performing Shradh is a part of abiding by Dharma. Meaning : A son protects his pitars from the Hell named ‘Pun’; therefore, Deity Brahma Himself has called him ‘putra’. As per the above shloka, every son should perform rites like Shradh to enable his pitars to progress to higher subtle-regions, to relieve them from experiencing innumerable sufferings and so that from Pitrulok, they bestow their grace upon their descendants. It becomes amply clear that this is the duty of those who call themselves putra (Son). Meaning : Never commit any mistake in tasks pertaining to Deities or pitars. Do not avoid them either. D. Given ahead is a perceptive shloka from Shrimadbhagwadgita in context of the people who do not perform Shradh. Meaning : Due to the non-performance of rites such as pinḍadan, Shradh, tarpana (Ritualistic offering water to the pitars) etc., the ancestors of such people (who do not perform Shradh) go to the Hell region. As a consequence, it prevents the emancipation of the descendants. E. Sage Sumantu says, ‘श्राद्धात् परतरं नान्यत् श्रेयस्करमुदाहृतम् ।’, meaning, there is nothing more beneficial than a Shradh. 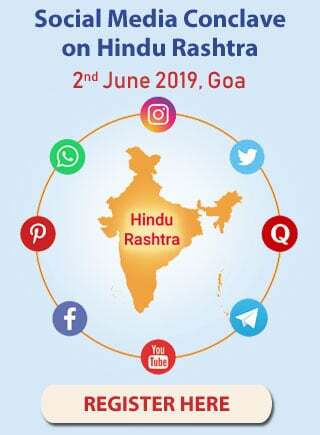 Therefore, an individual who has power of discrimination should never ignore Shradh. H. If a deceased individual wishes that someone perform Shradh for him/her and if this wish does not get fulfilled from the expected descendant, then the individual becomes unhappy due to nonfulfillment of its desire. Possibility of such deceased individual becoming a pishach (A type of spirit of a deceased individual), and taking revenge on its relatives for not performing the Shradh rites does exist. At times, the soul of a deceased individual manifests in its relative and starts speaking. 2 I. Let us say, while alive an individual feels that Shradh is meaningless and that no one should perform Shradh for him after his death. However, after death, he realises that because of Shradh not being performed, he is entrapped; but he is unable to convey his feelings to anyone. This unfulfilled wish could make him unhappy. From this perspective, it is appropriate to perform Shradh for every deceased individual. J. Performing Shradh settles the give-and-take account with an individual. For example, if we owe something to an individual and he dies before he is repaid. Then to repay that debt his/her Shradh should be performed. K. In the present age, people neither perform rites like Shradh nor perform sadhana (Spiritual practice) the way they did in earlier times; therefore, most people suffer from distress due to the subtle-bodies of dissatisfied pitars. Only spiritually evolved individuals (Saints) can tell us whether pitars are causing distress to us or if the possibility of such distress exists. If it is not possible to seek guidance from a spiritually evolved individual, the problems mentioned ahead can be assumed to have been caused by pitars – regular conflicts in the family, not getting along with each another, unemployment, lack of savings, serious illness, inability to get married despite favourable conditions, marital discord, inability to conceive, repeated abortions, giving birth to a physically handicapped or a mentally retarded child and a family member getting addicted. Performing Shradh satisfies the pitars and in turn they bless their descendants. It also provides momentum to ancestors who are entrapped in the region of the dead. In effect, it eliminates the distress due to pitars. L. When Shradh is performed on the tithi of demise of an individual, the food offered on that day nourishes the subtle-body of that individual for the whole year. So long as there are desires and expectations, the deceased individual expects food from his descendants on that particular day. By performing Shradh, not only are the desires of pitars fulfilled, but they also get energy for their onward journey. A single intense desire is sufficient to hamper the onward journey; for, the energy obtained from the Shradh is utilized to fulfil that desire. Hence, when Shradh is performed regularly, over a period, their desires diminish and they begin to acquire momemtum. Similarly, as per the rules laid down by the scriptures, it is only appropriate that so long as we are alive, as a token of gratitude towards our pitars, we perform their Shradh every year. In Kaliyug, because of the excess of Raja-Tama components the number of individuals performing spiritual practice is less. It is because of the unsatisfied desires a jiva does not gain momentum for moving to the next higher region. So also, due to lack of strength obtained from spiritual practice, a jiva keeps floundering. 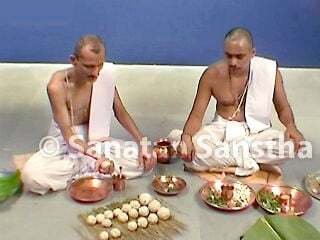 If rites such as Shradh as per the tithi, Mahalaya Shradh are not performed, the pitars do not gain momentum for their onward journey. Even if Shradh is performed at a Holy place, only those pitars benefit whose time to get liberated is near. Apart from this Shradh, it is necessary to perform the annual Shradh for other pitars. 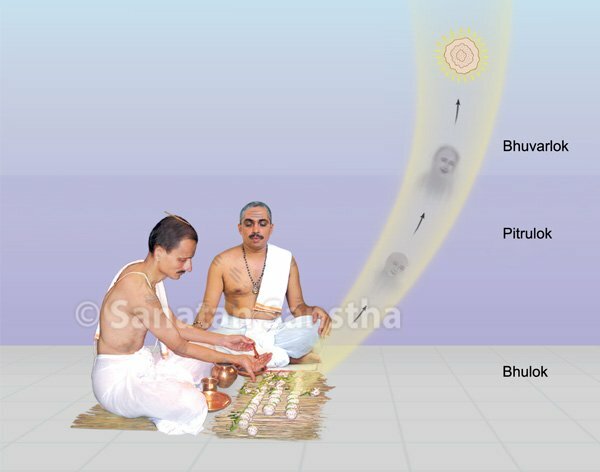 Perform Shradh for pitars who have a high spiritual level, only because it is prescribed by the scriptures and to set ideals of spiritual level is abiding by Dharma. Besides, there is hardly anyone in the society who can tell the spiritual level of our pitars. 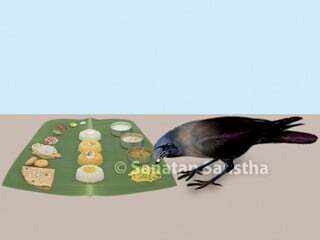 Meaning : Long life, a male child, success, heaven, fame, nourishment, strength, riches, animals, happiness, wealth, food grains are aspects that can be obtained by worshipping the pitars, meaning, by performing Shradh. B. If Shradh is performed during an eclipse, the performer obtains the fruit of having donated the earth.